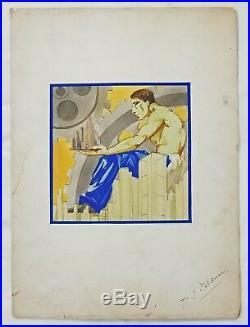 1930's Art Deco Mixed Media Illustration. 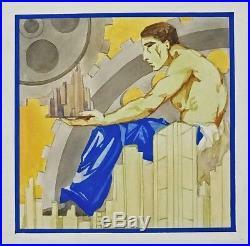 Untitled, image is of a man holding a city amidst gears. Possibly a study for a larger work. Condition: image is in good condition. Toning and wear in margins. Tear in left side margin, edge and corner wear. Medium: Pencil, watercolor and gouache on heavy paper. 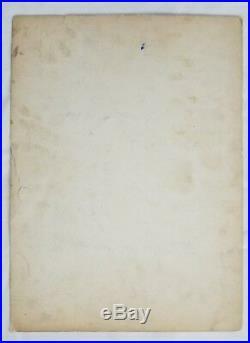 Size: 15" x 11" sheet and 6 3/4" 6 3/4" image. Unsigned, personalized in Margin: For J. Attributed to Rockwell Kent with no authentication, content, age. Style and medium appear to align with Kent's work. Please message us with any questions. 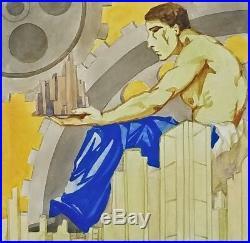 The item "1930's Art Deco Mixed Media Illustration, Gears of the City, Attr. Rockwell Kent" is in sale since Wednesday, August 15, 2018. This item is in the category "Art\Paintings". 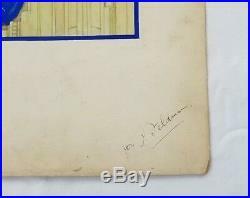 The seller is "pvl95" and is located in Kingston, New York.